Place flours, butter and cheese in food processor; pulse until mixture is loose. Add water until dough comes together and holds its shape. Turn dough into 9 or 10-inch tart pan, starting at the center and working out, press the dough into a pan in an even layer. While dough chills, slice tomatoes thickly, then lay the slices out on paper towels and salt lightly. This will draw excess moisture out of the tomatoes. Remove the chilled tart shell from refrigerator and prick with tines of a fork, then line with parchment and fill with pie weights. Bake crust 10-15 minutes, until lightly golden. 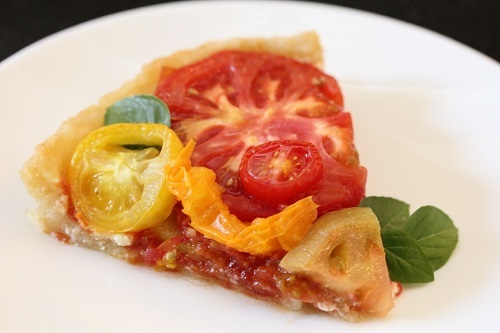 Spread heirloom tomato preserves in an even layer across the tart crust, then drop dollops of goat cheese across the preserve. Layer the cut tomatoes across the top, then return to oven for additional 20-25 minutes, until crust is deep golden brown. Garnish with basil leaves and sprinkle of sea salt. Drizzle with olive oil and serve tart at room temperature.